Knife is vital for every kitchen. 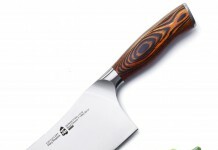 Kitchen knife is one of the basic culinary instruments that speed up cooking process notably, often seen to be driving cooking enthusiasts crazy, when they visit shop for buying the best piece for best price. 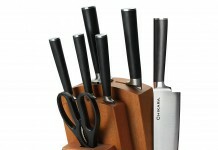 However Chicago Cutlery knife set is one smart addition to all kitchens. Whether professional Chef or simple homemaker, none could ever devalue its efficacy. Brilliant, powerful and reliable, cutlery knife from Chicago is one of the best things that every cooking expert would like to have. Although there are, varying knives available in the market but such a beautiful, well-organized, strong knife and that is too for inexpensive price is hard to find. One most rampant issue with usual steel knife is that, they develop rust and stain in due course, rust that affects performance and makes the homeowner change it time and again but not with this set of knives. These knives are made of high-end superior quality steel and made to undergo various tests that confirm the inherent competence of the knives, they have brilliant resistance power and heavy-duty in terms of performance. Must for every kitchen, this brilliant fusion forged knife set is made of high-carbon stainless steel, so there is no probability for rust or stain, excellent comfort grip does not put any pressure on the wrist or finger while chopping, mincing or dicing vegetable or anything. 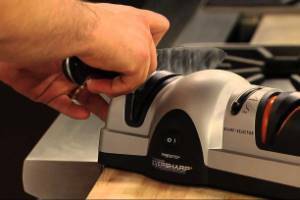 Optimum sharpness is what deemed its strong point and gives flawless cutting and slicing experience all through. Its razor sharp edge can be sharpened again and again without affecting the overall structure of the knife as few knives are seen reducing in strength while undergoing whetting in due course. 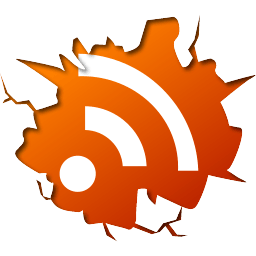 The steel is harder and consistent in performance, not at all subjected to rust and stain. The knives are having long lasting edge which is the gift of Taper Grind Edge Technology. The set comes with fantastic looking pine wood block that looks attractive in every kitchen countertop. The set is accessible with lifetime warranty. As for this Chicago Cutlery Knife Set there is 7.75 Inch Chef Knife, 7 Inch Santuko Knife, 5 Inch Utility Knife, 8 Inch Slicer Knife. The knives are having forged bolster for better balance so that fingers never come in direct contact to the sharp edge. 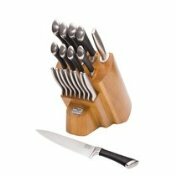 Best for professional use and great value for regular kitchens this knife set is available with block sharpener for immediate sharpening experience. All the knives here are made with high end steel so there is no probability for denting, chipping and rusting. Since the handle is also made of the same steel that goes into the making of the blade so there is no probability for the knife to go slip or lose control. Even after everyday use, the knife hardly needs any sharpening, the knives are available in varying shapes and sizes. Hence, whether it is about chopping potatoes or butchering pork everything is possible with these Chicago Cutlery Knife Set. While enumerating the cons, its heavy weight is hinted by few as tough to get on, otherwise everything about this knife set is just perfect. Although rigorous whetting is not needed but occasional honing helps in maintaining its ability, the set needs little maintenance. 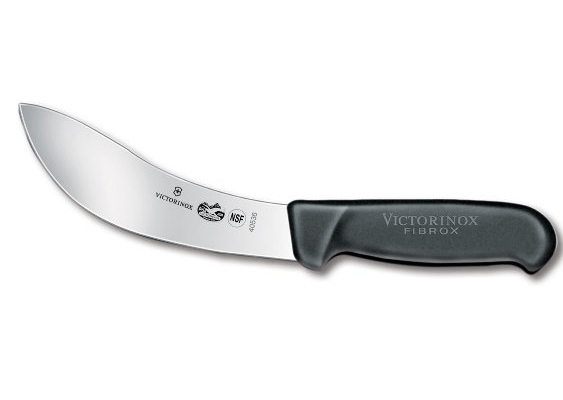 The set comes in forged bolster that helps in safe slicing and dicing. Incredible high end Japanese stainless steel blades capable of giving incredible cutting and slicing experience, this DesignPro 13-Piece Block Knife Set is must for every kitchen. They are known to retain sharpness for longer period of time and their grip is reliable as there is least possibility for the knife suddenly flung in air while cutting a pork or cleaning fish. The wooden block is excellent and exudes an air of sophistication. 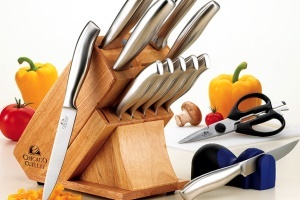 The tapered beveled edge of this Chicago Cutlery Knife Set is safe to use and looks stylish. There is a scissors, there is 8″ chef, 7″ samtou, 5″ scalloped utility, 3.25″ parer, 2.75″ peeler, 4 steak knives that are 4.25″. 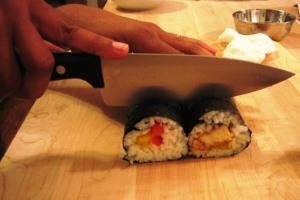 The blade is capable of slicing through the crusted blade without creating any mess. This amazing set is comprised of varying knives having varying sizes like 7.75 Inch Chef Knife, 8 Inch Bread Knife, 5 Inch Utility Knife, 3.5 Inch Paring Knife, 3 Inch Peeler Knife, (8) 4.5 Inch Steak Knives. The set is outstanding for its Taper Edge Grind Stainless Steel Blade, these blades are strong, rust and stain proof. Preparing meal using these knives is quite an entertaining experience as it does no exhaust the user. 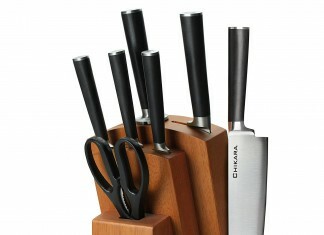 Undoubtedly the blades are a great addition to the kitchen and looks great when kept on the countertop. The block is made of dark wood, so undoubtedly rich in appearance. The knives are unmatched in quality and performance and quite unbendable under regular pressure. 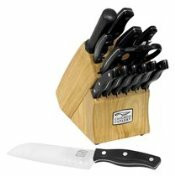 Easy to clean and long lasting this Chicago Cutlery Knife Set is great value for the price. 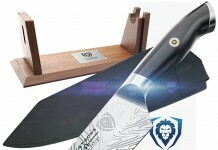 As the name suggests the knife set is cosmopolitan in its looks and performance. Hardwearing, long lasting this set of knife is sure to enhance the culinary experience. 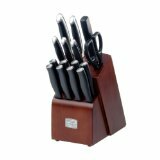 The knife set is comprised of large and small 2 chefs knives, a serrated bread knife, 2 paring knives, a carving knife, 6 steak knives, a pair of kitchen shears. So a essential accessory for every kitchen and professional meal preparing counter. 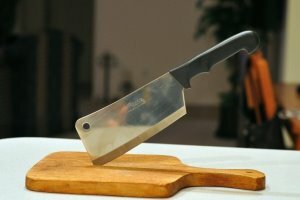 The black polymer handle gives tight gripping, so there are no probabilities for the knife go tosses in the air while chopping the meat. Excellent knives that demand little honing from time to time instead of thorough whetting and brilliant to fall back on while preparing food for a large number of invites, these knives an excellent addition to the kitchen area. The block is amazing and exudes inescapable rick look. For the price given, the set is brilliant and instead of buying something local or expensive the knives are great to buy.